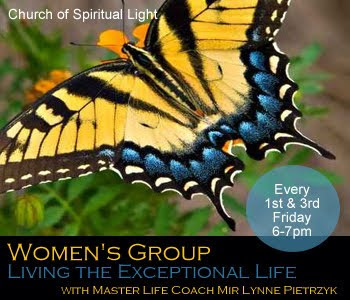 This group is open to all women who would like to be a part of a supportive and open community. Come and share! Do you want to experience a profound opening of the heart? Are you feeling stuck in old thought patterns? Would you like to experience the Divine Feminine through the Ancient Knowledge of Stones and Crystals? Sophia…Divine Mother, Holy Spirit, Mother of all Living, Bride of Christ is calling us all home to ourselves. You have heard her call in the unseen energies of your soul, and you have witnessed her energy in the outer of the world. 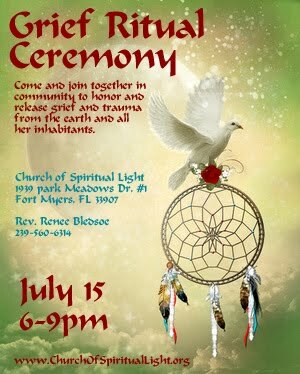 Join us at Church of Spiritual Light, 1939 Park Meadows Dr. #1, Fort Myers, FL 33907 for a gathering of our community to Release Grief from ourselves, each other, the earth and the mass consciousness. This is a beautiful ceremony, that is very dignified yet honoring of both our personal and collective pain. Someone once said, "It's not your tears that will kill you. It's the lack thereof!" 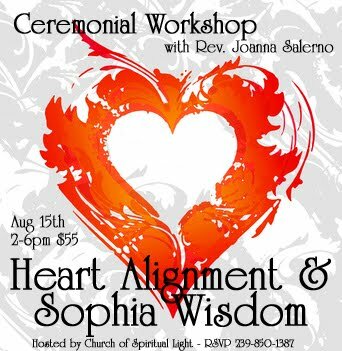 We will have a beautiful grandmother drum at the ceremony, music, burning bowl ritual and an amazing Rainforest altar, bringing in the South American Serpent for healing of the heart! Thank you to Peggy Bridenbaker for the Grandmother Drum!